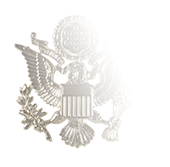 The Coast Guard Auxiliary’s rules for name tags closely follow those of the Coast Guard, but they are certainly not identical. Auxiliary name tags are the same size as the Coast Guard’s, measuring .625” inch high and 3.1875” wide (5/8 of an inch and 3-3/16 of an inch), but the Auxiliary’s tags are white with letters in Coast Guard blue; the USCG uses Air Force-blue name tags with white letters. In both services, 1/4-inch letters are used to spell the last name and 3/16-inch letters are used to inscribe the service name below it; all text is horizontally centered. 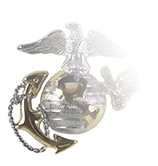 First and last names are allowed on the name tag in both services provided that the first name is either the servicemember’s full first name or a conventional shortening of it (Mike for Michael, Bill for William, etc. 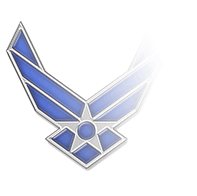 ), but Commanders have the authority to require a separate standard nametag (last name and service only) in cases where a higher degree of uniformity is required. 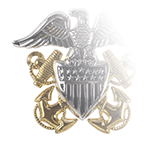 The most glaring difference in the name tag regulations of the two services is that the Coast Guard allows insignias (Search and Rescue School, NATON, etc.) to be placed to the left of the name is space permits. 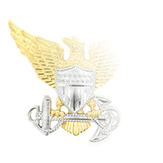 No insignias are permitted on Coast Guard Auxiliary name tags.